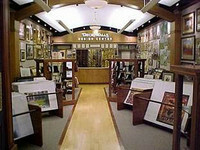 Deck the Walls is North America's premier franchisor of art, custom framing and wall décor. Located primarily in shopping malls, we have been in business since 1979 and franchising since 1981. Each store offers a large selection of art and custom frame options, plus our unique framing systems. We have a friendly, inviting, creative atmosphere that you and your customers will both enjoy. Entrepreneur Magazine has consistently named Deck The Walls and our sister concept, The Great Frame Up, as two of the top franchises in the Art & Custom Framing category. Deck The Walls is a Franchise Concepts, Inc. (FCI) company. FCI is the world's largest, most successful franchisor of retail art and custom framing stores. Besides owning both Deck The Walls and The Great Frame Up, two of the largest national art and custom framing franchises in the United States, FCI also owns Framing & Art Centre, the only national art and custom framing franchise in Canada. Therefore, as part of FCI's rapidly growing family, which now has over 300 stores, you'll enjoy some unbeatable advantages! Why Deck The Walls may be the perfect franchise opportunity for you! With our dominant industry position, we've been able to negotiate major discounts, not only with leading publishers, distributors and suppliers, but also with credit card providers, insurance companies and more - discounts that will give your business a serious advantage over every other competitor out there. We'll help evaluate potential sites and assist in negotiating the best possible lease. We even recommend our experience architects to oversee the entire construction process. In short, we offer a complete turn-key package. We know what it takes to make a store work, and we will make sure yours gets off on the right foot, right from the beginning. We have an intensive training program, designed to teach you everything you need to know to hit the ground running right from day one. At your request we will be happy to help you obtain third party financing. With our reputation, clout and proven track record and national presence, finding a lender to work with you should not be difficult. We can locate an excellent location in a mall or non-mall location near where you live, or if you'd prefer, you can use this as an opportunity to relocate to just about any other area of the country. Our National Marketing Fund was established to provide you with a full range of top-quality and merchandising materials - the kind you couldn't possibly get as an independent business owner. We have over 40 dedicated professionals working full-time for you in our Franchise Support Center in St Louis, Mo. We also have Field Operations Managers that work closely with you. We will be there for you every step of the way. If you're looking for a rewarding business in a growing industry, a business with a respected brand name, a proven operating system and strong support programs, you won't find a more fun, more creative or more satisfying opportunity than Deck The Walls. To help you stay current on all aspects of the industry and to help you get to know your fellow franchisees around the country, we hold valuable seminars, workshops and idea sharing sessions at our area, regional and national meetings. We lead the industry in utilizing technology in our stores. From our intranet system to our e-commerce program to our automated framing equipment, our goal is to enhance the shopping experience, grow top and bottom-line sales and profits and simplify our franchisees lives.